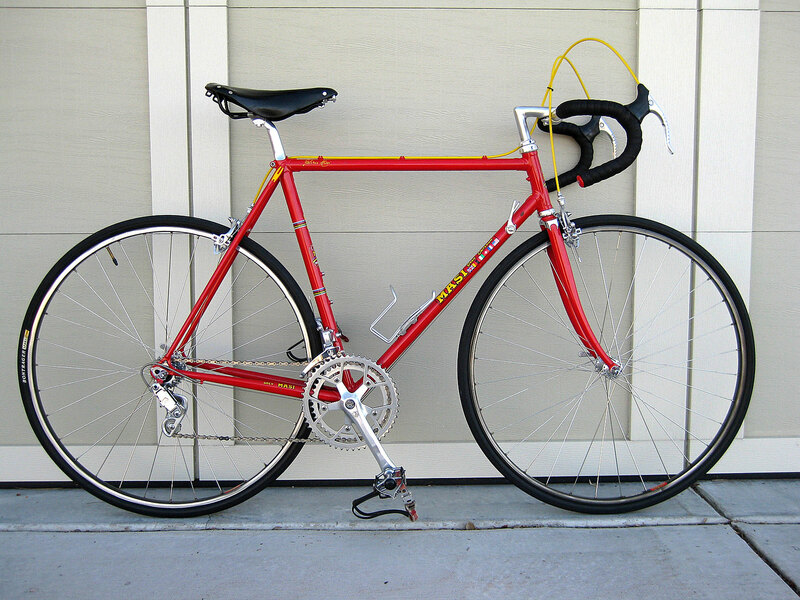 Wondering what the value of a 1987 Masi Gran Criterium, American frame would be. It has been repainted and decaled. Would $500 be too much, too little or just about right? Frame only. This one is tough - for some folks the repaint hurts value, but that's GORGEOUS. I'm not sure what it would sell for frame only on eBay and suspect it's a variable item. I wouldn't criticize someone for paying $500, or think they over paid. If I wanted it...I'd pay it. I wouldn't be thrilled, but I would. Compare it to the price of a new Surly Pacer frameset. I'd much rather build the Masi, especially with the repaint. I don't know why repainting/re-decalling a nice frame like that is such a big sin to many in C&V, Heck, many important/historic vehicles are repainted as part of their restoration and do not lose any value, as long as it is done correctly. I think $500 is slightly on the high side, but still fair, especially if that includes shipping. That looks nice. Don't know the value as I'm not in the market, but does look nice. Had to repaint my '78 frame sometime in the early 80's. I sent it to the Masi factory for a (at that time newer) 2-tone paint but I had them put the orig. decals on it. At that time Masi updated to the decals with the 'smooth' font not the orig. block-type font. Don't know how many frames that look like mine are out there--but I ain't selling. So is the fork and headset included or is it truly "frame only"? Seems dumb to sell it without the fork, headset could go either way. Needs clarification. Agree with Chombi that the price is a little high. The repaints looks to be well done, but I wonder why was a repaint necessary. That is always the unexpressed question on a repaint. If the price is for the frame, fork and headset, $500 is about max. Here is one of those times where the equation gets difficult. Frame sets always seem to get a better price than if part of a whole bike. The paint is pretty good, but the top tube is not perfect, repaints always are held to a higher standard because they are younger. I cannot tell if a 54 or 55. A 55 cm will have a bigger audience. I have one from this period and I like it quite well. I bought it at the time when they showed up on ebay frequently enough that a whole Super Record reduced bike would not garner $800. I think those days are gone. Transactions have been fewer, most in the $1,000 to $1,200 range for a clean example. This includes the Frame, Fork, Headset and Campy Aero seatpost. Those campy posts can be worth a bit if in nice shape, and a good condition Campy headset is another few bucks. Solid deal on a nice frame. The extras put it into a little better position. If it fits, buy and build. I just got back from looking at the frame and bought it. The pictures at the start of the thread do not do it justice. It is gorgeous !!! The seller was very much like me; in his '50's, has a nice collection of bikes and just looking to thin the herd of ones that aren't the perfect fit. When I noticed that the front derailleur is a braze-on, I mentioned that I didn't have one and he said, "oh I've got a Campy one I'll just give you. Pretty nice guy. 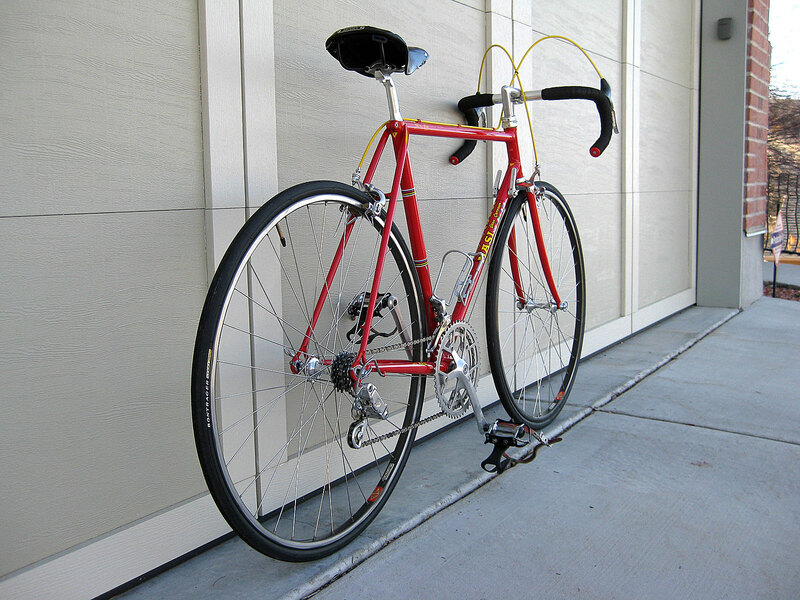 "Genuine '80s Masi 53 cm frameset made in California. I'm the second owner; I bought it on ebay four years ago and didn't ride it much (it's too small for me). The original owner said he repainted it a better shade of red (or so he thought) and redecaled it upon purchase (why I'll never know...). It has a 126 mm rear dropout (as it came with a 6 spd Nuovo Record gruppo which I quickly replaced with the '98 Record kit shown in the first pic [WHICH IS NOT INCLUDED IN THE SALE]). You are buying the frame, fork and headset shown in the pix. Lots of life left in frameset." I will take some better detailed pics soon. I didn't see how you could go wrong. Build and enjoy for many, many years to come. It looks gorgeous in the photos - I can't wait to see more. Well done! I think you made a good purchase and it will build into a beautiful bike. Finally got around to building this Masi. Have taken it out on two rides, but it's getting a bit cold outside. I'm really loving the ride. Wow. Not a 53cm though, which is good as I would be jealous. Actually, it is a 53.5cm measured traditionally (c-c); Masi measures it at 55cm. When you get a chance, try some Veloflex Corsas. That bike is the reason for n+1. That's very nice. You're saying that the repaint was done when new - so it's 25 year old paint? I have an '89 that I've been thinking about selling. It's a little different than your's at the seat stay caps. Mine has the MASI logo.